ORDER Hard copies of the report are available for purchase at $15 each to cover printing and shipping costs. Bulk discounts area available for orders larger than ten, and educational discounts are also available. A Portrait of California goes beyond the state’s fiscal and budgetary woes to examine the well-being of its people using the American Human Development Index, a measure based on official government data in health, education, and living standards. This timely report introduces the ‘Five Californias’ to highlight the varied opportunities open to differing segments of the population, and provides close-up snapshots of major metro areas. The report also ranks native-born and foreign-born residents for each major ethnic group, as well as all 233 Census neighborhoods in the state. The report concludes with recommendations aligned with current fiscal realities for protecting and building upon human development successes already in place. Asian American women in California can expect to live up to 88.6 years, over 18 years longer than African American men. A gap of $58,000 in median personal earnings separate the top earners in the Santa Clara–Cupertino, Saratoga, Los Gatos area (about $73,000) from the lowest earners in the LA–East Adams–Exposition Park area (about $15,000)—a gap double the median personal earnings for the country as a whole. Just 100 of California’s nearly 2,500 high schools account for nearly half of the state’s dropouts. California’s Latina women earn the least, at $18,000—earnings on par with those of the typical American worker in 1960, half a century ago. 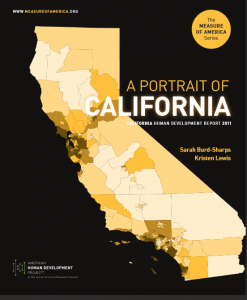 A Portrait of California highlights actions that Californians can take to lock in human development successes today while setting the stage for significant budget savings and improved well-being tomorrow. These include investing in public health campaigns and food subsidies for fruits and vegetables; investing in preschool and targeting the worst performing high schools with the highest dropout rates; and taking steps to address gender equality and wage discrimination in the workplace. DONORS TO A Portrait of California: The California Community Foundation, The California Endowment, the Conrad N. Hilton Foundation, the Draper Foundation, The Lincy Foundation, the San Francisco Foundation, United Ways of California, and the Weingart Foundation.